I have learned a lot in my role as the acting Executive Director for my IT organization, a role I’ve held for the last 7 months. While I’ve held management positions for more than a decade, I have learned more in this position when it comes to organizational change dynamics as well as leadership/management because of the significant scope/depth of the responsibilities and the challenges of the position. One of the lessons I’ve learned is that to be an effective organizational leader you need to be an effective manager and to be an effective manager, you need to be an effective leader. In short, leadership and management go hand in hand when it comes to delivering results. I’ve seen quotes on the web that goes something like this “culture eats strategy for breakfast/lunch” or some variation of that as if one is more important than the other. 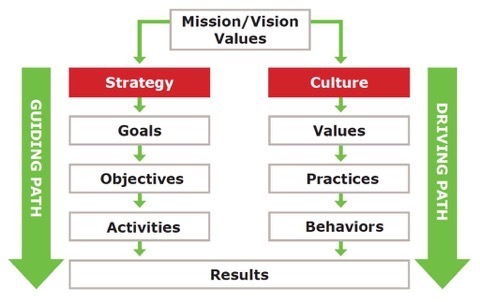 I get the sentiment that an organization can implement strategies and processes all day long but it won’t work without a culture that supports these strategies. One thing I’ve come to learn though is that ultimately, what people want from their leaders/managers are results. As reminded to me by a few staff after our initial department retreat soon after I took on this position, I can talk all I want but the only way I can prove my merit and effectiveness is by following through and delivering on what I/we had intended to accomplish. I was speaking with a colleague of mine who said “Joe, you’re doing a great job setting the culture of collaboration and transparency, but we do need you to provide clearer strategy towards the things you want us to accomplish as a department.” That conversation reminded me that as a leader, I need to influence and shape the culture of the organization and at the same time to provide a sense of direction, clear direction, for folks to follow especially when going to a place that is unfamiliar to them. A mentor of mine once said “manage constraints and lead towards possibilities” and I also read somewhere that “you manage things and you lead people”. I’ve led enough projects to understand that scope, time, and cost are variables that need to be managed when delivering projects. These are all constraints that need to be managed. But I’ve seen too often when project managers treat people as merely project resources and sometimes like factory robots just expected to follow orders. Any effective project manager would recognize the need to treat people as more than units of resources but rather human beings whose motivations and personal satisfactions cannot be ignored. Treat people as robots and they will give you the bare minimum, treat them with respect and as human beings and you’ll get more productivity out of them. That’s from personal experience any way. The credibility of an organization’s leader are based on the consistency between their actions and their words and their ability to deliver results. To be able to deliver results require that they have the skills to manage constraints and leadership competencies to get the maximum effort out of people towards the achievement of intended goals.